SANTA CLARA, CA – January 30, 2018 – Silicon Valley Bank (SVB), the bank of the world’s most innovative companies and their investors, released its ninth annual Startup Outlook report today. The survey found that many startups globally believe that business conditions will be better this year compared to 2017, with 30 percent globally noting that 2018 conditions will be much better. The series of reports offers international perspectives from more than 1,000 startup founders and executives, primarily in the US, UK and China. The reports examine startup leaders’ insights on business conditions, fundraising, hiring, workforce diversity and public policy issues, including the impact of regulations, taxes and immigration policies. “In today’s fast-changing world, it’s more important than ever to continue promoting companies that are inventing the future. It’s imperative to remain supportive of the innovation economy as it becomes an even bigger driver of job growth and contributor to the overall economic health by creating good-paying jobs that attract best-in-class talent and offer affordable healthcare to employees. Most US Startup Outlook 2018 respondents are founders or executives of companies with fewer than 50 employees (59 percent) and less than $25 million in annual revenue (63 percent). The key findings from the US survey, which is based on responses from more than 620 executives at technology and healthcare startups follow. 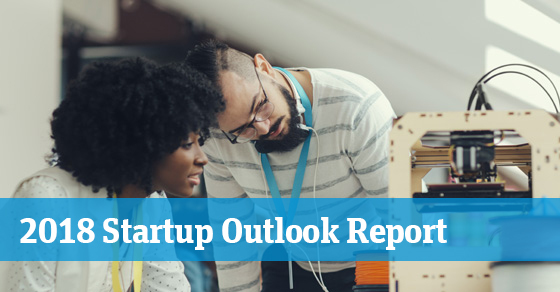 Startup Outlook reports specific to the UK and China are available here. While most startups plan to hire, 91 percent say that finding workers with the skills necessary to grow their business is somewhat or extremely challenging. Follow the conversation on Twitter at @SVB_Financial with #StartupOutlook.